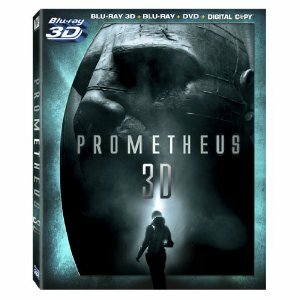 WorldMovieStore - Prometheus Sinopsis. Prometheus is bound to be eye filling, with fully wrought planetary vistas and occasionally jaw-dropping visual coups. And did we use the word alien back there? Yes, folks, Prometheus is a prequel, in a sideways sort of fashion, to Scott's 1979 Alien original--or at least it's a long-distant stage setter for that story. This one begins with a space mission that could reveal the extraterrestrial roots of Earth, although what's buried out on the planet turns out to be much more complicated than expected. In the midst of suspenseful episodes (and a few contrived plot turns), Prometheus reaches for Big Answers to Big Questions, in a grand old sci-fi tradition. This lends the movie a hint of metaphysical energy, even if Scott's reach extends well, well beyond his grasp. The hokier moments are carried off with brio by Michael Fassbender (the robot on board), Charlize Theron, and Idris Elba, and then you've got Noomi Rapace entering the badass hall of fame for a long, oh-no-they-didn't sequence involving radical surgery, which might just induce the vapors in a few viewers. Even if Prometheus has its holes, the sheer size of the thing is exciting to be around. Because this movie is gigantic.--Robert Horton. Read More Sinopsis. 0 Response to "Prometheus Blu-ray"